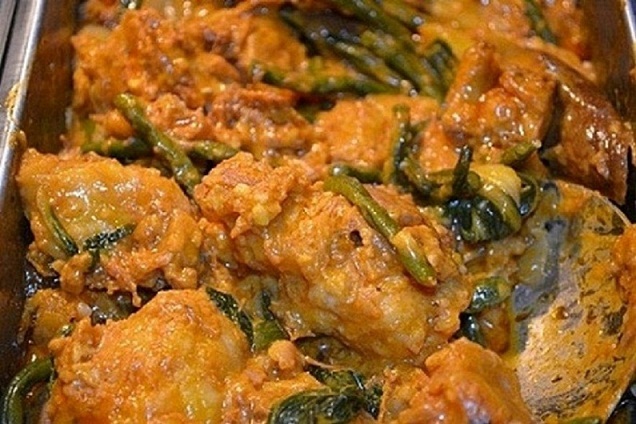 One dish that we can truly say is truly Filipino made is Kare-kare. The Filipino cuisine is a melting pot, no pun intended, of different influences like Chinese and Spanish cooking. There are only a few dishes that originated in the country. 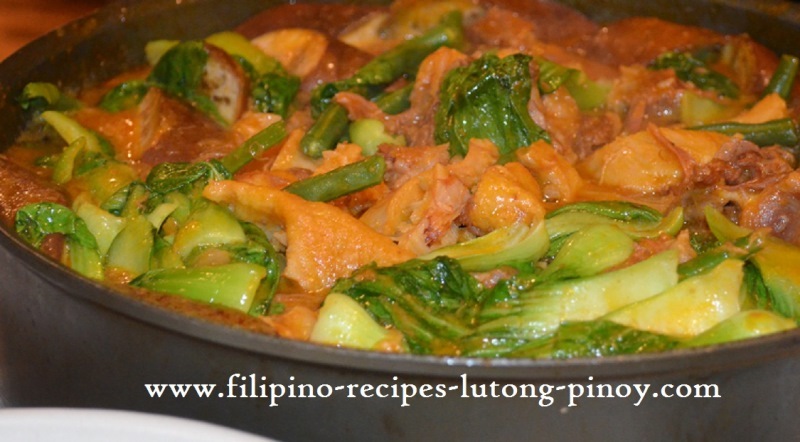 This is a traditional Filipino stew usually made with oxtail, beef, pork leg and tripe. Occasionally, chicken and goat meat are also used. It is basically made from a thick peanut sauce with a variety of vegetables added to it. The most commonly used vegetables are eggplant, string beans, pechay (Chinese cabbage) or banana flower bud. The meat is boiled first to tenderize it, and then ground roasted peanuts or peanut butter is added to thicken the soup. The vegetables are then added along with atsuete (annatto seeds) to give its color. Another distinctly Filipino ingredient, the bagoong alamang (shrimp paste) is served on the side to add a touch of saltiness. 1. Put the oxtail, salt and water in a large pot. Bring to a boil and simmer for about 2-3 hours or until the meat is tender. If you are using a pressure cooker, let it cook for 35 minutes. Remove the foam or scum that rises to the surface. Remove the meat, pat them dry and set aside. 2. Heat the oil in a pan and brown the oxtail on both sides. Remove the meat and sauté the garlic and onion. 3. Put the oxtail, garlic and onion back in the pot with the stock. Bring to a boil, and then add the atsuete mixture and toasted rice flour. Season with salt and pepper. Simmer for about 5 minutes. 4. Add the vegetables in 2 minute intervals starting with the sitaw, then eggplant, puso ng saging, then pechay. Simmer for another 15 minutes. 5. Combine the peanut butter and a cup of the broth in a bowl. Pour it back in the pot. Simmer for another 10 minutes or until the sauce has thickened. 6. Transfer to a serving dish and serve with sautéed bagoong alamang.